This is my first year planting gladiolus and out of 10 bulbs, five survived the hunger of squirrels. I have spent a bit of money investing in moth balls, but these little rascals just went around them, dug up, and ate the bulbs. These beautiful lavender gladiolus made my heart sing with joy! 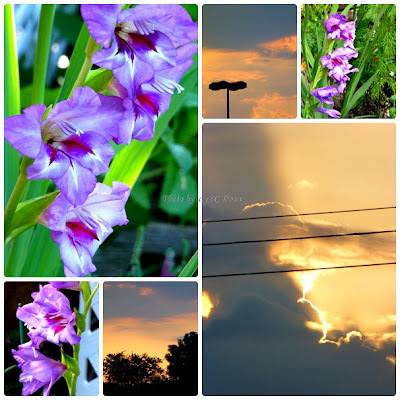 Yes, five bulbs grew into tall stalks, and these lavender gladiolus were the first to bloom. They were so beautiful, and the amazing thing about this stalk of flowers was that it was not as strong or healthy at all compared to other stalks. In fact, this stalk was growing on its side, wimpy, and small. The other three healthy, tallest, and bushy stalks didn't produce any flowers, but the wimpiest stalks did. They are very pretty, so glad the squirrels did not get these. Beautiful photos! Oh they are absolutely GORGEOUS!!!!!!!!!! i am always delighted to see your blossoming plants, Icy, so beautiful. Oh, such glorious flowers! And gorgeous skies! Jeszcze takich ślicznych nie widziałam, dobrze, że wiewiórki nie zjadły wszystkich cebulek.Pozdrawiam. Yet I have not seen such lovely, well that is not eaten by squirrels all bulbs. Yours.